To Paulo Nimer Pjota (b. 1988, São José do Rio Preto, Brazil) art-making is a lengthy process to record impressions of society, places, life and history. Layer after layer, his composite works reveal the complexity of the real: never seamless nor smooth, but rather incoherent, undefined, rough and ever-evolving. 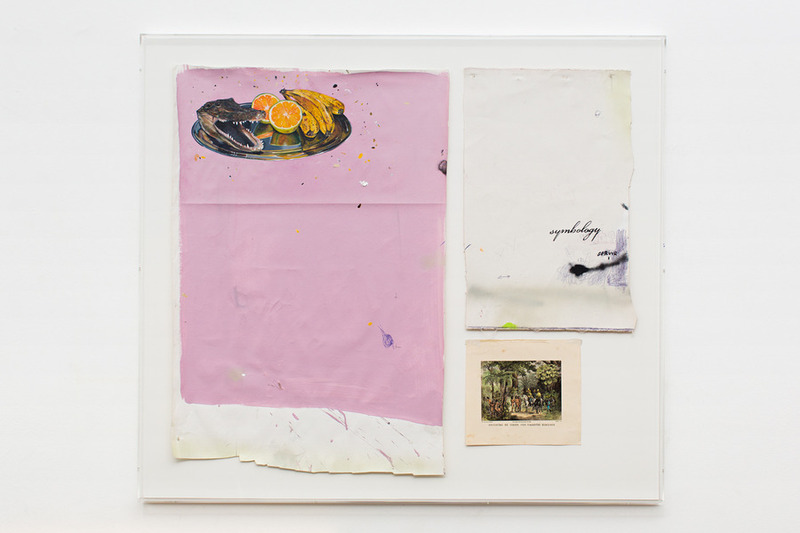 Pjota collates canvas, sacks and metal plates – mostly found in junkyards – to compose wall works, preferably in large format. 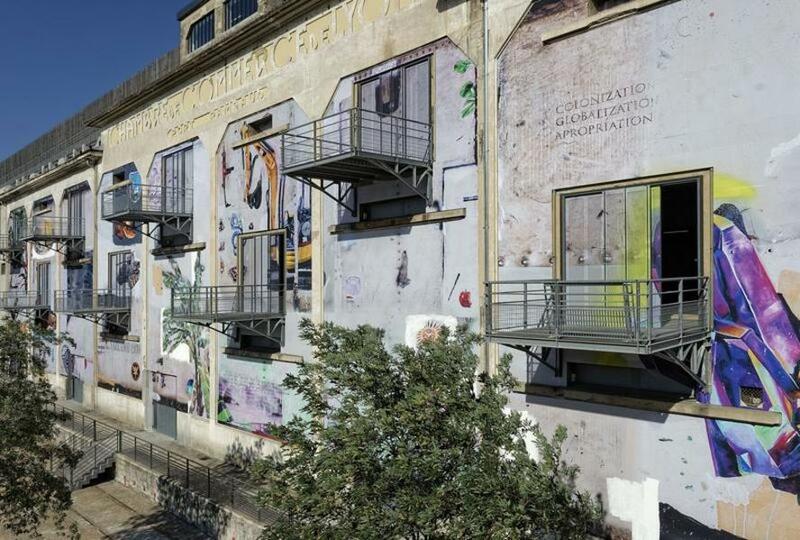 At the 12th Lyon Biennale (2013), he populated the gigantic facade of La Sucrière, a former sugar factory and main Biennale venue, with symbolic images. In a corner the mural read “power and the fascination of image”. The appreciation of engravings, prisoners’ drawings and tattoo art reveals his past as graffiti artist on the street of Saõ Paulo, where Pjota moved to at the age of 17 to attend art school. He takes inspiration from the vernacular constructions of the ghettoes to create visual narratives that combine the complex contemporary culture with art history. While the texture and colour of the paints he uses call to mind cheap plasters, Pjota admittedly looks up to artists such as Cy Twombly and Jean-Michel Basquiat, he’s influenced by ancient portraiture and he is interested in history and philosophy. These noble references are mixed with icons, stereotypes and products of popular culture: superheroes and cartoons characters are juxtaposed with kalashnikovs, greek vases and fruits in what resembles closely the aesthetic of religious offers to the Orixàs (gods). Interview with Paulo Nimer Pjota from the exhibition “Imagine Brazil” at Astrup Fearnley Museet. from Astrup Fearnley Museet on Vimeo. These conflicting elements are vital to the metaphoric narratives intertwined in his works. Political issues, histories and current affairs are also reflected in the choice of materials, often bearing the signs of their previous use and therefore benefiting of a ‘potential of expression’ similar to that of art itself. Paulo Nimer Pjota lives and works in Saõ Paulo, where he is represented by Mendes Wood DM. His first UK solo show, Synthesis of Contradictory Ideas, and the Plurality of the Object as Image Part 2, runs at Maureen Paley until May 29, 2016. For the month of May, CtC will present a selection of four works by Paulo Nimer Pjota to use as weekly cover images of our social media. Follow us on Facebook or Twitter to discover the next one. Paulo Nimer Pjota, Permuta entre Dois Estados Temporais (Passage Between Two Temporal States) (2013) at the 12th Biennale de Lyon. ©Paulo Nimer Pjota, courtesy the artist, La Biennale de Lyon.